ABSOLUTELY TRUE! thank you for following my little blog and hello from Italy! Pingback: Welcome to a new friend: Vicky…the Northern Chicky | Hey Sweetheart, Get Me Rewrite! Happy Monday and thank you for letting me find you! 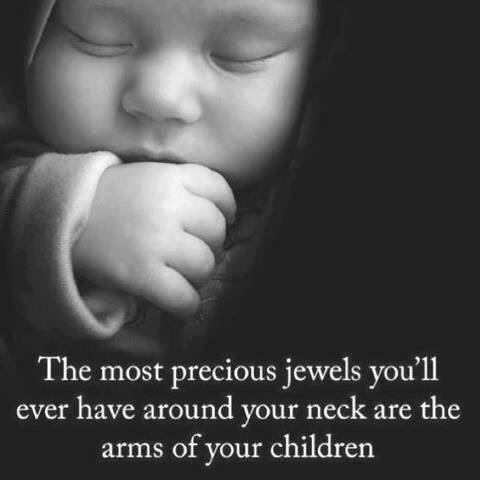 Clean or dirty, sticky or not, those are the the most priceless jewels you will ever have around your neck. True, lovable, cute , very sweet post ! Thanks for following my WP blog ! Thank you for popping by and following my blog! Made my day! Reblogged this on The Silver Lining. How inspiring ! Thank you so much for following my blog ! “Happy Tuesday” from Marseille, France ! Love it! Thanks for visiting and following my blog! So true. I think this every day that my daughter asks for extra kissies and huggies. Most beautiful picture…and true words. Thank you for following my blog. When I have a little more time, later tonight, I’ll be exploring your blog. It looks great. Such a beautiful thought. Children are a blessing. I can see that you’ve written a lot of really nice posts, will visit again to read. Very true. I love hearing: ‘Mummy, cuddle!’ Thank you for following my blog! Vicky, I DIDN’T see this post until THIS monday and had a bad week, so I wish I had seen it in time! THANKS for subscribing to my funny-caption photoblog, TheDailyGraff.com, and leaving a “like”! I hope I can bring you a smile (or at least a groan) every weekday. couldn’t help but share this…so sweet and true! I loved it and will reblog. Thanks! I couldn’t agree more. Precious children deserve to be treated as the priceless jewels they are.